One of the joys of working in Stanley Park is having the gift of time to really explore and observe the wildlife and organisms of a Pacific Northwest rainforest. Seasoned Park workers still delight in coming upon a raccoon family foraging in a pond or a glimpse of a barred owl roosting in an old growth maple tree. But some of the best gifts of the Park come in very small packages, and it’s worth the time it takes to find them. Michael Schmidt, a long time volunteer photographer for SPES, has spent hundreds of hours combing the ecosystems of Stanley Park, capturing in pixels not only the Park’s iconic animals – its great blue herons, eagles, coyotes, birds, and river otters – but also its very small inhabitants, many of which are not yet listed in SPES’s inventory of the Park. Released by SPES in 2010, the ‘State of the Park Report for the Ecological Integrity of Stanley Park’ (SOPEI) is a comprehensive review of all living organisms in Stanley Park, but there is still room for additions to SPES’s 2019 SOPEI update due out in the spring. The tiniest organisms are, of course, the most elusive and difficult to catalogue. 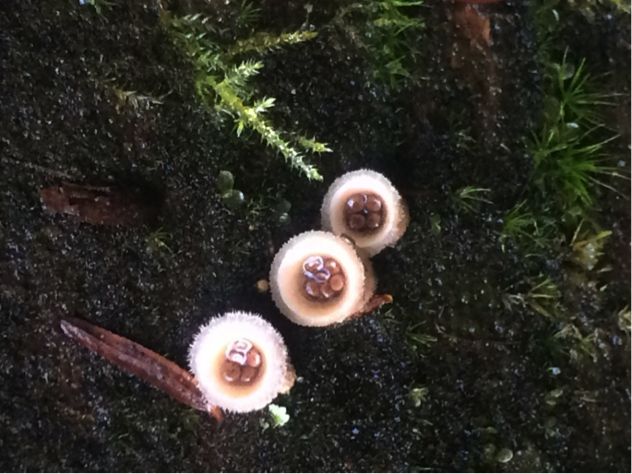 Bird’s Nest Fungus in Stanley Park. Photo by: Michael Schmidt. Michael’s discovery last month of the miniscule Bird’s Nest Fungus is testament to that. This intriguing fungus, like all fungi, works its way through the wood of fallen trees consuming cellulose or lignin, growing and producing spores in the mushrooms that are visible to us, and releasing base nutrients that the surrounding forest needs to grow. The tiny discs within the center or ‘nest’ of the mushroom are this fungi’s ‘eggs’ called peridioles – flung out and distributed when rain droplets splash into the cup. SPES will be working with mycologists in the near future to compile the Park’s first comprehensive list of fungi for SOPEI. Coral slime in Stanley Park. Photo by: Michael Schmidt. Equally intriguing are a host of bizarre species in the Park that were formerly classified as part of the fungi kingdom. 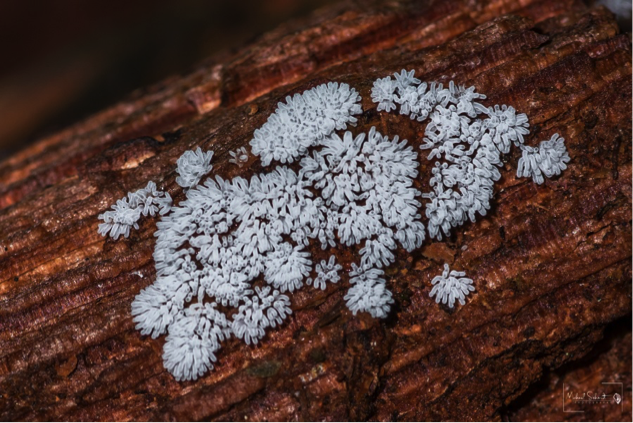 These bright patches of slime, or slime moulds, normally exist as single-celled organisms – except when food is in short supply, whereupon many of the single cells will congregate and start moving as a unified body to detect food sources. Stanley Park. Photo by K. Stormont. Understanding what lives in Stanley Park, from the big to the small, will ensure the ecological integrity of Vancouver’s largest green space for generations to come. 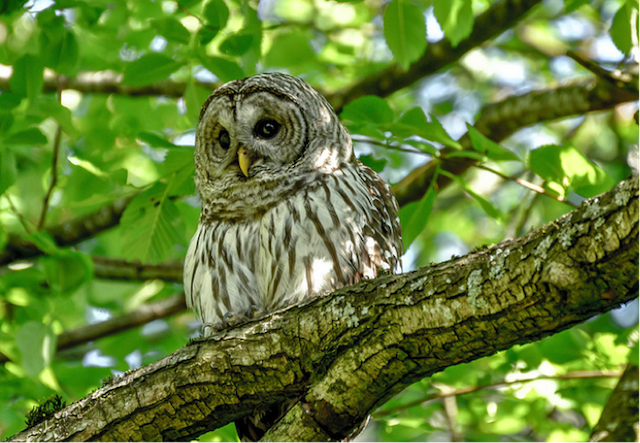 The ‘Stanley Park Ecological Action Plan’, created by SPES and Park Commissioners, is informed by SOPEI’s accurate inventory of wildlife and plants in the Park. 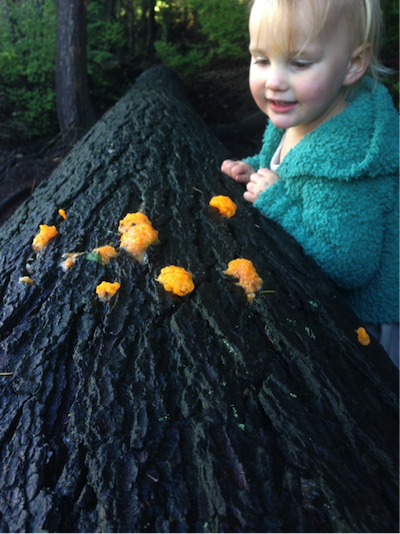 You can help us with that inventory: we invite you to share your Stanley Park discoveries with SPES, especially the small ones! Who knows, you might even uncover an undocumented species. Follow the Stanley Park Ecology Society on Facebook, Instagram, and Twitter for more information. This post has been contributed by Kathleen Stormont with the Stanley Park Ecology Society ("SPES"). Since 2013, I have been a member of SPES and have published "SPES Saturday" guest posts from the society on Miss604.com.